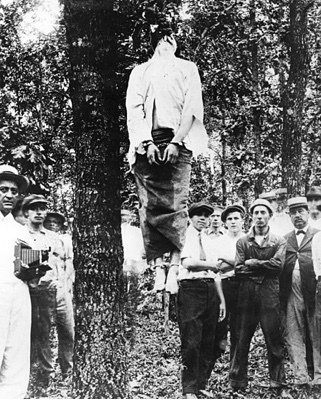 Leo Frank's lynching on the morning of August 17, 1915. Although anti-Semitism has been a steady presence throughout American history, until Saturday’s mass shooting attack on the congregants of a Pittsburgh synagogue that left 11 dead, the attacks have more often than not been nonphysical. Swastikas and offensive slogans were painted on the walls of synagogues, and bomb threats issued to Jewish community institutions. If the Ku Klux Klan and other white supremacists carried out an estimated 3,500 lynchings of African-Americans in the century following the Civil War, the number of Jewish victims of the virulently anti-Semitic organization can be counted on a single hand. The first known “lynching” of a Jew in the American South was actually a shooting – of merchant Samuel A. Bierfield, who, together with a black clerk from his general store in Franklin, Tennessee, was shot to death on August 15, 1868, during Reconstruction. No one was ever convicted of the killings, and the background and motive remain murky, although the nascent Ku Klux Klan was apparently involved.